Last Call for Summer! Apply Today! Beauty coexists with poverty; challenge coexists with hope. Service & Hiking Maine is an exploration of these ideas. Maine offers stunning landscapes, but this state also invites us to delve deeper into the challenges its communities face. Areas in both rural and urban Maine are confronting issues of food insecurity and educational inequity. 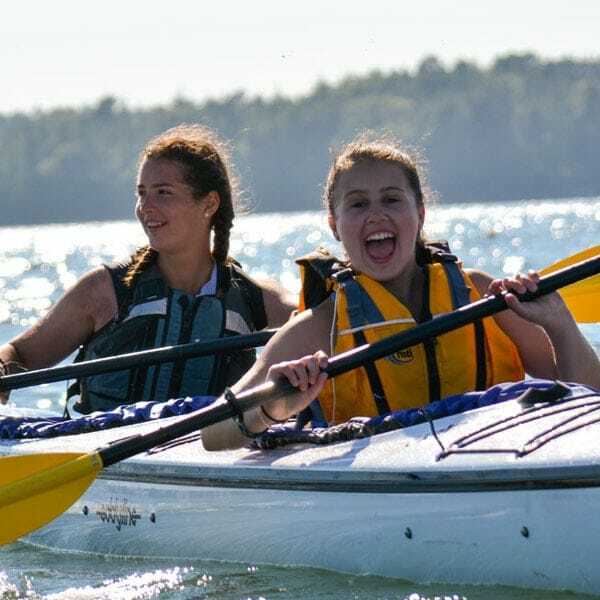 Over two weeks, we will engage with these challenges by putting effort and thought into community-based projects, while also enjoying pure summer fun in Maine. Meaningful engagement and active exploration: discovering the many faces and facets of Maine. We’ll start with work in community gardens and on local farms, learning about food systems and food access. 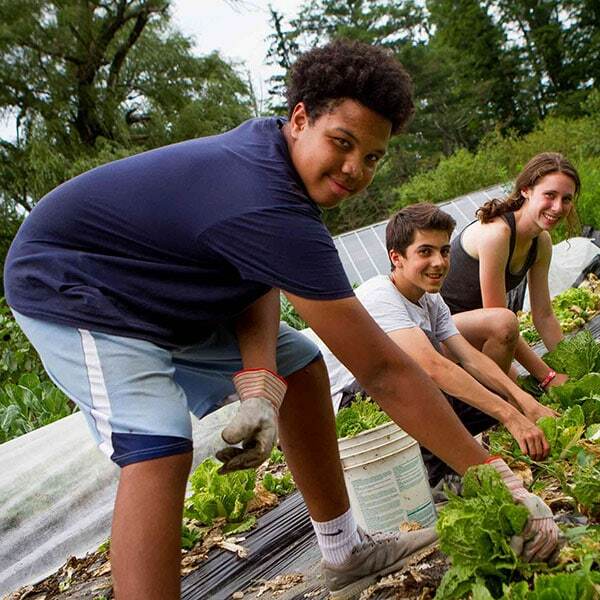 We will partner with a teen agriculture program to deliver produce to food pantries close by—a perfect opportunity to build relationships and better understand the community where we are living and working. We’ll then make our way north toward Baxter State Park, stopping to canoe on the Penobscott River for two days before we arrive. At Baxter State Park, we’ll hike, camp and improve the grounds of the park. Light construction will push us to work as a team to enhance the park and make it more accessible to hikers for years to come—and along the way we’ll enjoy hiking and camping, having fun and making friends. Having gained strength, experience and closeness as a group, we’ll undertake a challenge hike of Mount Katahdin. Katahdin is the tallest peak in Maine and also marks the northern terminus of the Appalachian Trail. It’s a big undertaking, but one we’ll be ready for. At trip end, we’ll look back on two weeks of stewardship, awareness, teamwork and accomplishment in Maine. We’ll have discovered the many faces and facets of the state, and we’ll be eager to continue to learn and explore the needs of other communities—whether that means engagement close to home or much farther afield. My trip was awesome. It was the highlight of my summer! Loved it! 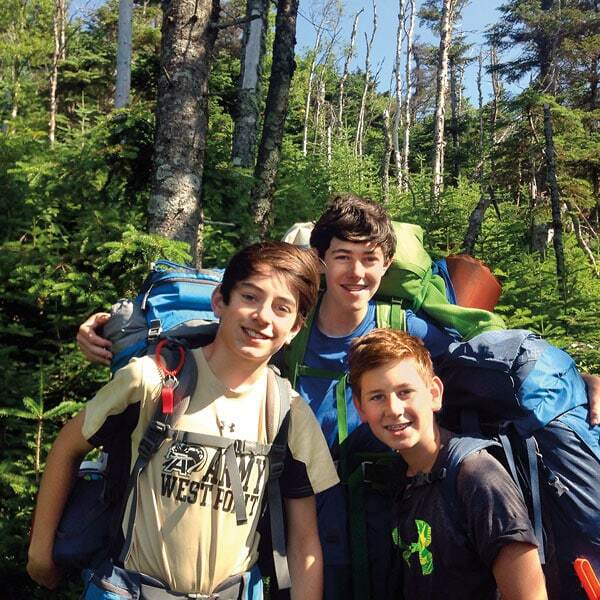 Experience the wonders of Maine through service and hiking with a lasting group of new friends. Once everyone has arrived, we’ll go for a short hike near Portland, settle into our campsite and start preparing for two weeks of service in the beautiful state of Maine. We will learn about our service partners, get to know one another and cook our first meal together. During our first three days together, we will work with a farm along Maine’s midcoast to grow, pick and manage produce. We’ll spend time learning about Maine’s agriculture and food system management and how local farms work closely with other volunteer programs. We’ll drive to the Penobscot River where we will embark on a two-day canoe trip. Professional guides will lead our group, and they’ll teach us how to steer our canoes and paddle efficiently. As we paddle, we’ll look across the water to Baxter State Park, our next destination. After canoeing, we’ll travel to Baxter State Park and and explore the area. We will work side by side with Park Specialists, volunteering and helping them with different opportunities that they have set up specifically for our groups. During this time we will see the beauty of the area and take in all of the sprawling ridgelines and valleys that make up the vast wilderness of Maine. We will finish our trip with a challenge hike up Mount Katahdin. This mountain, which is situated in Baxter State Park, is the tallest peak in Maine and also marks the northern terminus of the Appalachian Trail. We will work together to reach the summit, pacing ourselves and encouraging each other every step of the way. At trip end, we’ll return to Portland and look back on two weeks of outdoor exploration. We’ll celebrate our adventures, our accomplishments and the friendships we formed along the way. 5 nights of frontcountry camping with access to showers and bathroom facilities . 1 night of backcountry camping with no access to bathroom facilities. 6 nights of primitive campsites while in Baxter State Park. We will have access to composting toilets. Itinerary may vary by group and is subject to change. We travel light at Overland. 65-85 liters or 4,000-5,100 cubic inches. Before purchasing a backpack, find your backpack size by measuring your torso length and your hips (instructions are available here). We recommend getting fitted at a store and trying on multiple packs. We will send every student an Overland T-shirt prior to the trip. Please wear this T-shirt to trip start. Durable and suitable for service work. Please do not bring cotton sweatpants (they are heavy and bulky and will not keep you warm if wet). Waterproof material (e.g., Gore-Tex, or similar) is required. Your jacket should be large enough to allow layers underneath. Ponchos are not acceptable. If your backpack does not come with a cover, we recommend buying a cover one size larger than your pack. Basic two-shoulder backpack large enough to hold your lunch, two water bottles, snacks, extra layers and rain jacket. Use your day pack as a carry-on for your flight and for daily activities or hikes. A standard school backpack is usually fine (no satchels or shoulder bags). A lightweight, compact synthetic sleeping bag rated to 20 degrees Fahrenheit or less. A synthetic sleeping bag is required for this trip; down is not appropriate as it does not insulate if wet. Your sleeping bag should compress into a stuff sack no larger than 20" in length. ¾-length or full-length closed cell foam (thin and firm) or self-inflating. 6" to 8" plastic dish or bowl with top, insulated plastic mug, spoon, fork and knife. These don't need to be special camping utensils (a Tupperware dish and regular utensils are fine). Please bring an extra battery/batteries. One 1-liter bottle. A Camelbak or similar water carrier is acceptable. Calf-height, waterproof gaiters to protect your legs and feet when hiking through brush, across snow fields or streams. A lightweight, packable camp chair to use in camp (Crazy Creek, for example). Choose comfortable boots designed for hiking with a pack (i.e., mid to high cut for ankle support). Boots should be waterproof. Break them in before the start of your trip. Closed-toe shoes to wear around camp. Crocs or lightweight tennis shoes are ideal. A medium-size synthetic camping towel (synthetic camping towels dry much faster than regular towels). To organize and waterproof your gear and small items. Sturdy gloves to wear during volunteer work. To protect your feet from blisters. A digital or disposable camera. Please bring an original or copy of your health insurance card. If you are not flying: Overland does not require photo identification. If you are flying within the U.S.: The TSA website has two relevant pieces of information. (1) “TSA does not require children under 18 to provide identification when traveling with a companion within the United States.” This language indicates that TSA staff can insist that an under-18 year old who does not have a companion (we interpret this as a companion who is 18 or over traveling with them—not just checking them in) must have TSA-compliant identification. Our experience is that this requirement is inconsistently enforced but, since it might be enforced, we recommend that all Overland students who are flying to/from their trip have TSA-compliant identification. (2) “Contact the airline for questions regarding specific ID requirements for travelers under 18.” This is always smart to do as airline policies vary widely and change frequently. Each student should bring a debit card, an ATM card or a prepaid Visa card to cover spending money and miscellaneous expenses. Spending Money: While all meals and activities are included in the trip fee, we recommend $25/week for spending money (for example: for souvenirs or an occasional drink or snack beyond what is provided to the group as a whole). Miscellaneous Expenses: Most Overland students will incur some expenses while traveling (for example: an equipment repair or baggage fees at trip end). Please add $100 to the debit/ATM/Visa card (in addition to spending money), to cover these expenses. We travel light at Overland; please only bring the items on this list. Your group will have access to laundry periodically. Please do not bring your smart phone (or any other electronics). Please visit the FAQ tab for more information on our cell phone and electronics policy. Do not bring any type of knife or multi-tool (such as a Swiss Army knife or Leatherman tool). If you are flying to your trip, wear your hiking boots and carry your sleeping bag and sleeping pad on the plane in case your checked luggage fails to arrive on time. Pack everything in your backpack or day pack. Do not bring additional luggage. There are no reimbursements for lost, damaged or stolen items. Please schedule expensive items—phones, cameras, bicycles, etc.—on your homeowners insurance policy. What is the weather like on Service & Hiking Maine? You can expect typical summery weather with lots of sunshine, some rain, warm days and cool nights. What are the arrival and departure airports for my child's trip? Your child will fly to and from Portland International Jetport (PWM). We will provide more specific travel information once we have placed your child on a trip. How often will my child have access to showers and laundry? Groups typically shower and do laundry once a week. What do you do about bears? Traveling as a large group goes a long way in preventing unwanted attention from wildlife. In addition, we hike in well-traveled areas and train all of our staff in backcountry skills and awareness. We instruct our leaders how to set up camp and store food in ways that reduce the chances of attracting wildlife, including bears. We’ll brief students on these routines at the start of the trip. Both of our leaders also carry bear spray in case of a bear encounter. Please tell me about safety at Overland. Safety and risk management are at the forefront of our decision-making–from trip planning to leader training to supporting our groups in the field. We cannot guarantee absolute safety–no program can. All recreational activities include inherent risks. Therefore, we strive to manage the risks that we can, knowing we cannot eliminate them. We work hard to recruit, train and support our trip leaders so they can create the kind of trips that have made us successful for over 30 years. Please click here to read more about our approach to risk management and our accreditation by the American Camp Association. Does my child need to have previous experience? While no previous experience is required, we have high expectations of our students. We expect your child–with your help–to select a trip that is appropriate for their interests and abilities. You should spend some time familiarizing yourself with the details of the specific trip and help your child understand what to expect. We also expect our students to prepare ahead of time: to review the packing list, gather clothing and gear and complete whatever training the trip requires (for recommended training please see the Before You Go tab). Once the trip begins, your child should be ready–and excited–to contribute to a wholesome and enthusiastic group where each group member feels welcomed and valued. Please tell me about Overland's admissions process. When we receive your application, if your first choice is available, we will: (1) call you to acknowledge our receipt of your application, (2) send you an email with a link to our enrollment forms, and (3) charge a deposit of $795 to your credit card. If your first choice is not available, we will call you to discuss options. For more information, and to access our application, please visit our Apply page. What are Overland’s policies on phones, electronics and communication? To maximize independence and self-reliance, we do not permit phone calls, emails or text messages to or from our campers. Your child will call home on arrival and departure with our phones and assistance, and in the case of an emergency. If your child brings a phone for use while en route to Overland, please do not send an expensive smartphone. Instead, an inexpensive prepaid cell phone will do. All phones will be collected on arrival and returned at departure. While we will take reasonable steps to prevent damage, theft or loss, we take no responsibility for phones and we will not make any reimbursements for lost, damaged or stolen phones. Cameras are welcome but please do not bring any other electronics (e.g., iPods, iPads, Kindles or other readers, GPS or similar devices). All electronics (except cameras) will be mailed home on arrival (at your risk and expense). We are committed to providing extraordinary support to you and your child. To that end, the Overland office is staffed from 8:30 a.m. to 8:30 p.m. seven days a week during the summer. Outside of office hours, our answering service provides emergency coverage. Our leaders in the field are in touch with our office regularly; they carry cell phones (and in some cases satellite phones). Anytime a camper is treated for an injury or illness by a doctor or other medical personnel, parents are notified by our office. A director will call the parents to explain the nature of the injury or illness, the sequence of events leading up to the injury and/or the steps leading to the treatment. Parents are typically able to speak with the medical personnel, with the leaders and with their child. Can my child get credit for service hours? You should check with your child’s school about whether or not Overland’s service hours meet their requirements. The approximate number of hours of service are listed in the sidebar. We will provide your child with proof of participation after completion of his or her service work. Can I send mail to my child during a trip? 1. Please do not send anything valuable – please send letters, cards or postcards only. If mail is late, lost or misdirected, Overland’s leaders and staff are not able to return to the post office (or other mail stop) to collect it. 2. Please use the US Postal Service first-class mail only; do not use UPS, FedEx or DHL (many of our mail stops accept US Postal Service mail only). 3. Please do not send overnight letters: many overnighted letters arrive before or after we arrive and are then sent back. For this same reason, please do not send mail that requires a signature upon delivery. 4. Please allow one week for postal delivery to U.S. mail stops. 5. Please allow two weeks for postal delivery to international mail stops. Engage in community projects, explore coastal Maine and hike the state's wilderness. We expect you to arrive to your trip fully prepared for all activities. On Service & Hiking Maine, you will spend three days backpacking and do some additional hiking to and from your trail work campsite. You will hike over rolling terrain, following trails that may be rough, muddy or overgrown. While backpacking, you will carry all of your belongings (clothes, sleeping bag and pad), some group gear, food and water. Typically when backpacking, pack weights average about 30% of a hiker's weight. In the month before your trip, you should break-in your hiking boots (wear them a lot!) and complete the pre-trip training (see below). Once on your trip, you'll find that enthusiasm and a positive attitude will help to make the trip a success for you... and for everyone in your group. 4 weeks before your trip: take three 30-minute hikes or walks in your boots. 3 weeks before your trip: take three 1-hour hikes or walks in your boots. 2 weeks before your trip: take three 90-minute hikes in your boots with a backpack loaded with 10-15% of your body weight. 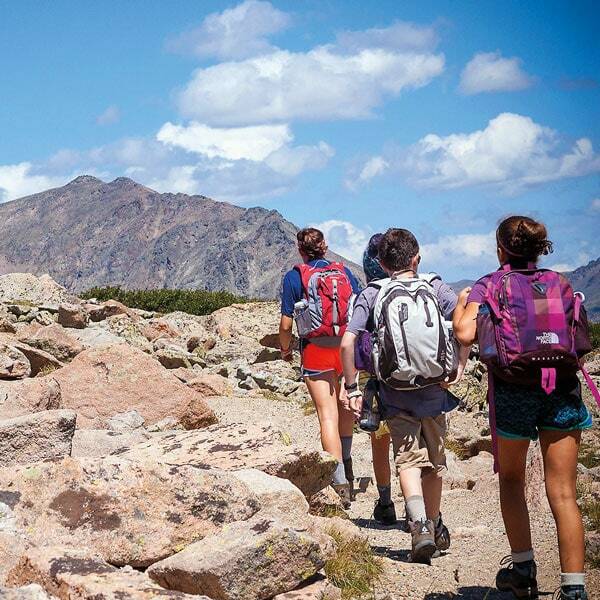 1 week before your trip: take three 2-hour hikes in your boots with a backpack loaded with 20-25% of your body weight. Trips involving service work require a positive attitude and willingness to work hard as a volunteer. You should be eager to participate in a variety of service projects. Please note some of the service opportunities your group pursues will depend on the needs of the local communities and available service opportunities. As the summer nears, stay active and fit through sports and exercise. Once your program starts, commit yourself wholeheartedly to your group and all of its activities. Overland trips are wholesome, structured experiences with high expectations of each student’s behavior. You are expected to be enthusiastic, positive, helpful and supportive of your trip mates and your leaders. We ask that you leave your cell phone and electronics at home (cameras are always welcome), so you can fully engage with your group and your trip. Arriving ready for a challenge—and prepared to contribute to an enthusiastic group—will go a long way toward creating a successful trip. Please contact us if you’d like to discuss preparing for your Overland trip.